The videos were being circulated on Thursday. They show dozens of demonstrators said to be on the streets in the town of Gohardasht, west of Tehran. The protesters are seen setting fire to police vehicles and shouting “death to the dictator.” Police respond with tear gas. Iran's state-run media briefly acknowledged the pockets of unrest in scant reports noting the protests were "without official permission" and isolated, but a series of social media videos emerged Wednesday and early Thursday which appear to show protests and clashes with police gaining steam across multiple cities. The Iranian rial dropped to an historic low this week just ahead of a new round of renewed US sanctions set to begin Monday, August 6. Previously in July protesters clashed with police in short-lived demonstrations outside of parliament in Tehran as merchants of the Grand Bazaar shuttered their stores while economic woes amidst looming sanctions renewal and runaway inflation meant they lost money by merely staying open. Those prior protests lasted only three days and included a swift crackdown by authorities; however this week's protest will likely continue to grow through the weekend. 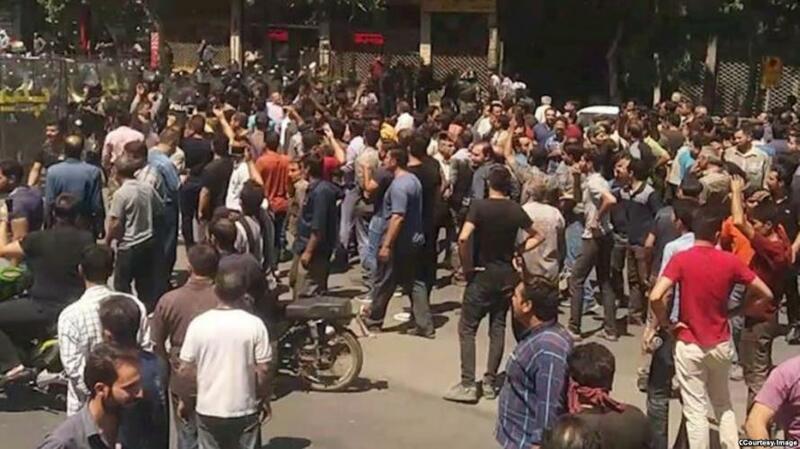 Demonstrations involving crowds of hundreds were reported on Wednesday and Thursday in a handful of locations, including in the northern city of Rasht, as well as the city of Karaj, adjacent to Iran's capital. Both cities witnessed fierce clashes with police deploying riot control measures, according to unverified social media accounts. Street clashes in Isfahan, #Iran. Activist accounts have also claimed government messages were sent to cell phones in the country accusing the United States and Saudi Arabia of stoking domestic turmoil. #BREAKING: Minutes ago, the regime's Ministry of Telecommunication just randomly sent this SMS for millions of #Iran|ians in which says: "the call for protests on Thursday is a plot of #US & #SaudiArabia". Iran's currency is now nearing collapse ahead of sanctions. Days ago an elite top military commander urged President Hassan Rouhani to take "revolutionary actions" to prop up the falling rial. Protesters appear to be responding primarily to a sharp hike in prices on imported products after the dollar's surge to record highs against the rial in black market trading. The unofficial rate of the Iranian rial plummeted to a record low at estimatesof between 112,000 and 120,000 rials against the dollar on concerns over the imminent return of full US sanctions. Addressing Iran's president, Islamic Revolutionary Guard Corps (IRGC) commander Mohammad Ali Jafari said,“The unique and extensive backing you benefited from in past weeks shouldn’t preclude you from taking revolutionary actions to control prices and prevent the enormous increase in the price of foreign currency and gold,” in an open letter published by the privately owned Tasnim news agency. “Decision-making in today’s difficult circumstances necessitates revolutionary determination and decisiveness in dealing with certain managers’ weaknesses,” the IRGC top commander said. With protests possibly in the early phases and as the August 6 US sanctions are set to take effect, things in Iran are likely about to get a lot worse.